This PowerPoint unpicks how to tackle a question about the school day in the writing exam. 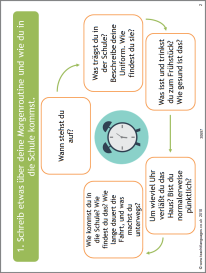 It is designed to tackle the 90 word crossover question, which appears in both the Foundation and Higher papers of AQA's GCSE German writing exam. Try using mini whiteboards for students to generate ideas from each slide, before they begin to write. The writing strip will further support them.